Archery is an technical sport with a long history, used traditionally for hunting and combat it is now an olympic and paralympic sport and is practised by all ages and abilities. During your session we will introduce you to the equipment and safety aspects then teach you safe use of a recurve bow and provide you with the skills and knowledge to hit the target consistently. Once you have grasped the basics we will then move onto a friendly competition and you can compete with your friends. 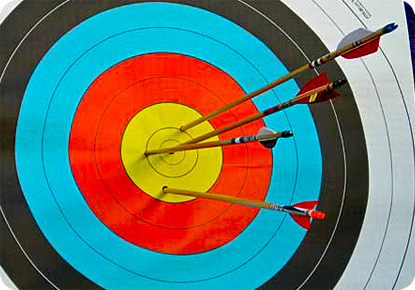 Archery is a great activity for team building events and perfect for a day on its own or as part of a package with our other activities.